My favorite memory from when I first started Fish & Bicycles, back in October 2009, was the outcome of my search for a photo or other image for the header of the blog. 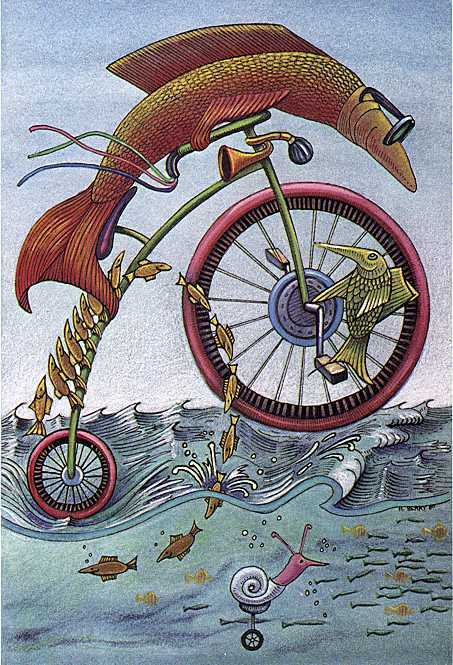 All it took was typing “Fish & Bicycles” into Google Image Search and one of the results on the very first page is the lede image you see here in this post, a print titled Basscycle, by artist Holly Berry. It could not have been more perfect, and so I emailed Holly, asked her for her permission to use the image, and she graciously agreed. Unfortunately, due to my limited Photoshop skills, I was not able to edit it into anything useful. The space for the header in my blog’s theme is 1000×288 pixels, the Guiness fish on a bicycle is much closer to a square, and when I tried to stretch it, crop it, adjust the levels, apply filters and effects, sadly, nothing worked. 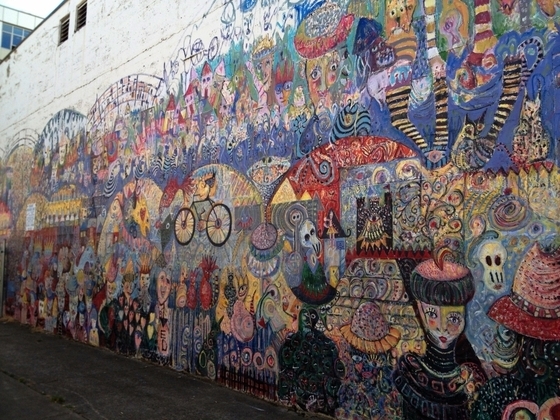 The mural, located on the east wall of 164 West Broadway, is the work of Hans d’Hollosy, a Eugene artist, and it is outrageous in all the best ways. More importantly, if you look close enough, you’ll see some fish and a bicycle just left of the center of the photo, and as I stood in that alley looking it over it became clear that this was exactly what I was looking for. I wasn’t sure whether or not I’d be able to edit it into a good 1000×288 pixel header, but I took some photos and couldn’t wait to try. The result? 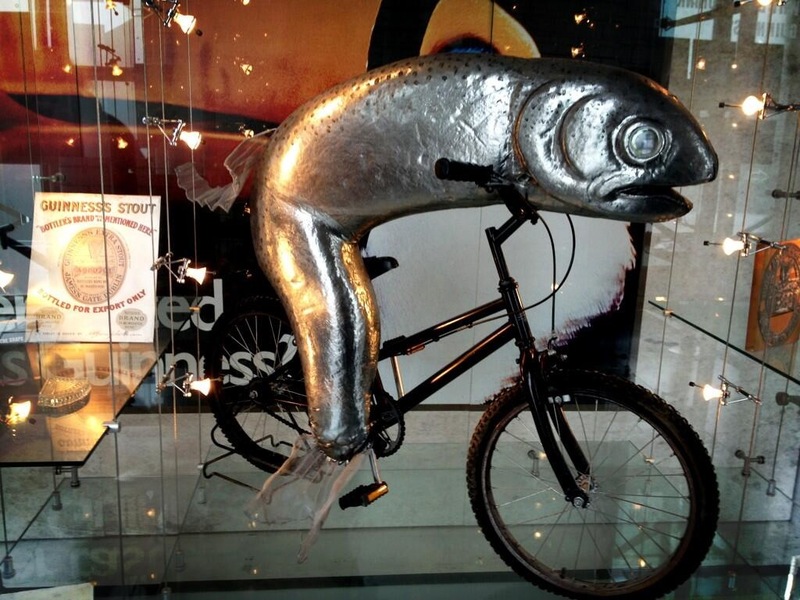 The new Fish & Bicycles header! In the meantime, I just can’t bear to do away with Holly Berry’s Basscycle, and so I’ve decided to leave it on my About page, and a snippet of it will continue to be visible in the site’s favicon and in the avatar I use, visible whenever I comment on a WordPress blog. I hope you enjoy Fish & Bicycles new look! Next ›Upcycling: Awesome Piano Bike! funny I was admiring the new header before I even read the post. Glad you are keeping Basscycle around still on the about page as I associate your blog with that image. Yeah, I’m still really fond of Basscycle too, always will be. You are SO welcome, Hans! Your work is truly, as I said, a gift. Hi Brian! Thanks for stopping by and sharing your appreciation for Hans’ mural. I did read about the Shakespearean elements, all the more reason for me to like the work, since I’m quite the lover of The Bard.